I’ll miss being able to pick out fresh cucumbers or be enticed by overflowing baskets of colorful peppers. Eggplants are disappearing, our little ghost eggplant, no longer so little, has stopped blooming. The three eggplantlings that are still growing will be our last for the year. The two purple brussels sprouts have grown into monsters with tiny brussels sprouts forming at the base of every leaf. They love the chill of autumn, a welcome respite from the high temperatures of summer. We’re hoping to have sprouts from our garden by Thanksgiving. For $1.50 spent on a whim, they’re giving back in spades. We’ve begun saving seeds from our Mexibell pepper plant so we can try to have one again the spring, along with seeds from the banana peppers we love to buy from our local farmer. We learned a lot this year about gardening – next year, we’ll try again on tomatoes and zucchini. Today’s recipe is a traditional Latvian recipe that my husband grew up with. Of course, the beans he used were from his mom’s garden: big, red and white patterned beans that were buttery and soft. One day, I’d like to grow some too, but I don’t think they’re well suited to Utah’s dry desert climate. Luckily, peruano beans make an excellent replacement, even if they’re smaller. It’s an easy recipe, just combine handfuls of everything until you have enough for however many people you need to feed. Peel, seed and dice cucumber into small cubes. Wrap a peeled carrot in a bit of plastic wrap and microwave for about a minute to make it more tender. Remove wrap (carefully!) and let cool. Dice into small cubes. 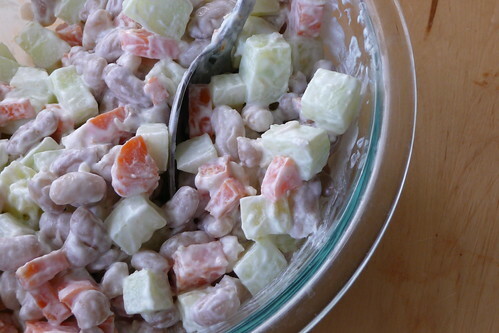 Toss cucumber and carrot with beans, sprinkle with a pinch of salt, then stir in a spoonful of sour cream. Add a bit of horseradish to your taste if you like. This entry was posted in dairy-free, gluten-free, latvian, recipes, salad, side, untranslated, vegan, vegetable, vegetarian. Bookmark the permalink.